One of the most important roles of parents is to help their children learn to relate to peers, and find their place in the world of their peers. Siblings are often the child’s first peers in that they are relatively equal in terms of power, and they also typically engage together in play. Positive relationships with both peers and siblings protect children from adversity. However, problematic peer or sibling relating, including bullying or conflict, can have serious consequences for mental health and behavior. Parenting impacts the development of peer and sibling relationships in similar ways. 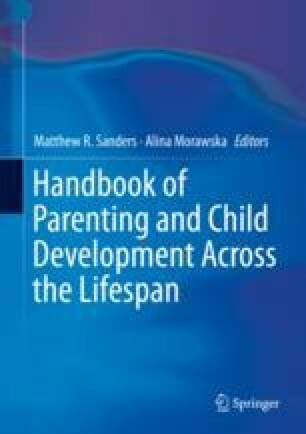 The aim of this chapter is to review research and theory about how parenting affects these relationships. The paths through which parents influence peer and sibling relationships are explored. Evidence of the effectiveness of parenting interventions to improve children’s peer and sibling relationship issues is examined. It is recommended that future research seeks to further differentiate the interplay of genetics and parenting affecting child outcomes, and that intervention trials examine the impact of interventions on both sibling and peer relationships. To date, most school interventions to address bullying and victimization have involved parents only minimally. There is, however, a great deal of evidence that involvement of parents and families is critical in addressing serious problems in peer, as well as sibling, relationships. The Parenting and Family Support Centre is partly funded by royalties stemming from published resources of the Triple P—Positive Parenting Program, which is developed and owned by the University of Queensland (UQ). Royalties are also distributed to the Faculty of Health and Behavioural Sciences at UQ and contributory authors of published Triple P resources. Triple P International (TPI) Pty Ltd. is a private company licensed by UniQuest Pty Ltd. on behalf of UQ, to publish and disseminate Triple P worldwide. The author of this chapter, Dr. Healy, has no share or ownership of TPI. Dr. Healy is a coauthor of Resilience Triple P and may in future receive royalties and/or consultancy fees from TPI related to this. TPI had no involvement in the study design, collection, analysis, or interpretation of data, or writing of this chapter.